Sorry for stopping at Blogmas Day 16, work & life just got better of me that my Blogmas this year was a fail. I have finally bought the Chanel Rouge Allure Gloss Colour and Shine Lipgloss in One Click which I have been wanting since its launch earlier this year. I settled on the no. 13 Affriolant. When I swatched the colour colour in the shop, it looked nudy corally pink compare to other colours. But after I bought it and worn it for the first time, it actually looked a brighter pink and more pigmented than my swatches in the shop, which actually was a good thing! I wear a light layer as a day to day colour, but it can be worn thicker to let the colour really show through and make lips look fuller! I am so happy that I got it! 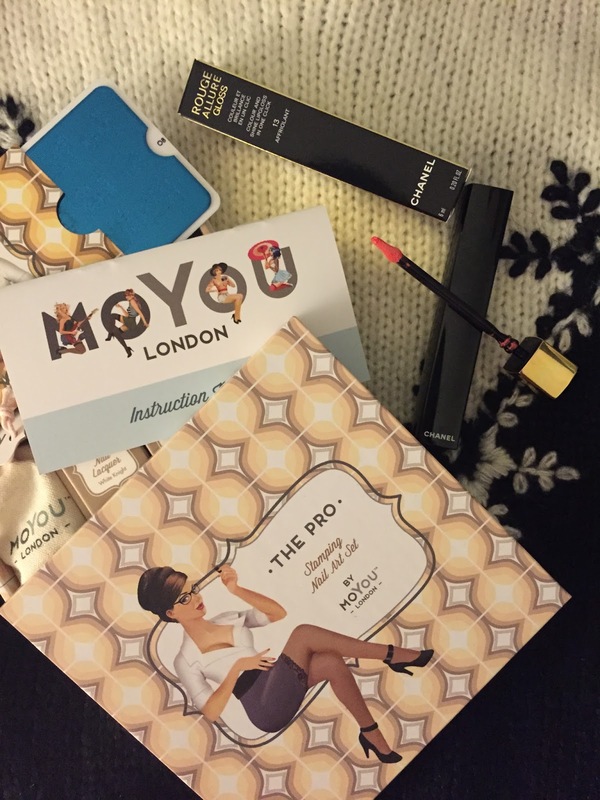 The second buy is a nail art kit from MoYou London. I'd never heard of MoYou London before until I saw their display in Boots. MoYou London create a whole range of patterned metal plates, which makes it so easy for everyone to create beautiful nail arts at home by easy stamping technique! I picked up The Pro set which contains two patterned metal plates, three stamping nail polishes, tools for stamping and an instruction booklet. I am going to play with it during the holidays, so keep an eye out for a review very soon! Meanwhile, I leave you with a quick demo from their YouTube Channel, I am sure you will be hooked!